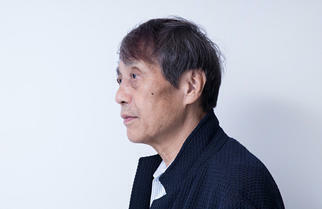 NO20 Yasuhiro Suzuki How would you turn Roppongi into an area of Design & Art? On the 5th floor of the Midtown Tower, in the Musashino Art University Design Lounge of the Tokyo Midtown Design Hub, artist Yasuhiro Suzuki drew sketches on the whiteboard covering one side of the wall. He was drawing to describe the gravity of the earth, the origins of "kendama" (a traditional Japanese cup-and-ball toy), and the background of his work "apple kendama"(English name: "more trees"). 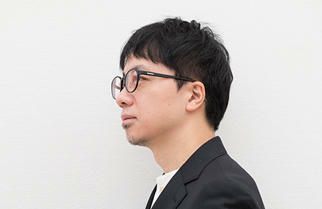 The title of the lecture he was giving was "Below the apple tree of the future", and his ideas held hints to change Roppongi into an area of art and design. 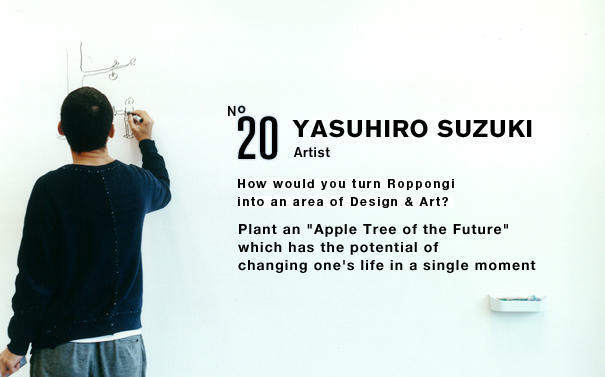 If an apple tree like the one Suzuki proposes were actually planted in Roppongi, it could potentially change the life of a visitor in one, special moment. Here I've drawn a picture of an apple tree. Standing below this tree are people of the future who have become tired of using science and technology to predict things that are likely to happen. With this apple tree, there is no knowing when the apple will drop. The people here are waiting to witness the moment the apple will fall, and they are holding sticks in their hands so that they can prick the fruit. They might observe and wait for many days, wondering if the apple will drop because it has become redder, or because there is a strong wind blowing. The apple might fall when a bird pecks at it. Many things could happen. You can't foresee what will happen, so it would feel great when you finally manage to prick that falling apple with the stick. It would be a wonderful game in which the nature is involved. I think that kind of fun was how the kendama originated. The "ken" of kendama refers to the stabbing sword - a sword to stab your enemy. The apple is a very important fruit for humans, but perhaps it might also be an enemy. An apple might have the intention of attacking humans by falling on people who happen to pass by. So people get the urge to fight the apple with swords. In Europe, this toy lacks the sword part, and there is just a cup to catch the ball. It was the Japanese who thought of attaching the sword to the cup; the sword can be interpreted as symbolizing the male, and the ball as symbolizing the female. When you look at things that people have created and think about their origins, you are eventually led to think about people themselves. I think that human beings are the very theme that links us to the future. We humans are part of nature, and despite the advances in science and technology, I think the important thing is to explore the creature-like expressions of humans and our raw sensibilities. Sketches that Suzuki drew on the day of the photo shoot. There would be only one apple ripening in the tree, and it would sometimes fall. On some days, people might go and find that the apple had already dropped. Perhaps "hanko" seals could be placed on the ground where the apple is likely to drop, so that when it falls and makes an impact, the date on the seal is imprinted on the surface. Well, perhaps that would be taking it a bit too far. (laughs) But people should be allowed to take home the fallen apple as a souvenir. The tree could be a real tree, or a man-made tree. It could be a tree where a person can hide inside and drop an apple when someone comes along. There might be times when the apple falls between two people walking by, and in such a case, each person would wonder how the other would respond. Or maybe a person with unsolved issues about work could approach the tree, and an apple might suddenly drop and help him or her to make a decision. I just think it would be nice if a falling apple could take people by surprise and create unexpected and special moments. Arranging the timing for the falling apple would be very important. Several times a year would be too few, so I suppose it should fall once every day. Perhaps it might be good if there was meaning behind the timing of the fall. It might be a moment when a historical figure was born, or when something new began. That kind of timing would be possible if you have records of what happened on what month and date and what hour and minute. So you need to think about choosing times that would please people. You need to consider how you could drop the apple so that people would feel it was a coincidence and think of it as a special moment. Perhaps what we usually think of as being coincidence are not always pure coincidence - perhaps someone may be offering them to us as gifts after carefully thinking of the best timing. I think this element is related to services and the spirit of hospitality. 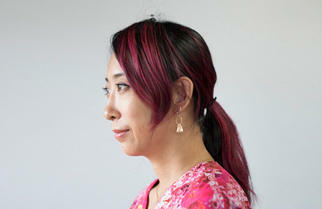 In the traditional Japanese inns, things happen with good timing, and the guests are delighted because it feels special. It's kind of similar to the traditional Japanese garden. The garden is not completely natural, but precisely because you can sense the human hand in it, you are able to appreciate the specialness of nature. When exhibiting my works, I put a lot of thought into how to create coincidences. That's why I talked earlier about having a person inside the tree and dropping an apple when people approach it. I have this wish to have my works seen at the best possible moment for the viewer. Without that ideal timing, there are times when it becomes somewhat difficult for people to understand the intent of my works. When a museum owns your works and permanently exhibits them, everyone can go and see them, but the fact is that people are not very attracted to things that are always there. For instance, public art is always located in the same place, so their specialness wears off. What I want to make is something that differs from the kind of public art that permanently sits outside; I wish to make public art that is not always there, that appears and then disappears, and where something might happen or might not happen; the apple tree project on my mind is one such example. When I heard that the theme of this interview is turning Roppongi into an area of design and art, it sounded a bit weird to me, to be honest. Maybe that's because it sounded as if the aim is to draw people to this place with art and design. In my view, there is no aim in art or design. Particularly with art, I think the ideal is for there to be a surprise. Art should create an unimagined moment, or lead to an unexpected awareness or discovery of something. Instead of placing artworks in order to attract visitors, I think Roppongi should be a place where people can spend a really special time - the kind of time they would remember all their lives. For me, spending that kind of time is what art is about. Discovering something unexpected by coincidence is called "serendipity." It would be fun if we could measure the frequency of serendipity on this earth. I wonder if we could get statistics by conducting a survey around the world, asking people if their lives have been changed or affected by towns. Perhaps there are towns that made people decide to get married there, or towns that gave people ideas they never had before. 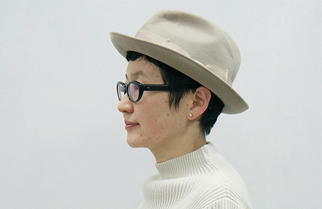 It would be great if there were results showing that Roppongi is a place where such moments are often created. I think a real art town is a town where that kind of serendipity is frequent. Suzuki's drawing of the apple tree that creates coincident moments. Inside the tree is a part-time worker who drops the apple with strategic timing. All my creative activities literally began in Shimotakaido. The apartment room was about the size of 8 tatami mats; I liked it because it was like a cave. I had machine tools there, and the room was overflowing with things and lots of books. The walls were covered by my written memos, and for 24 hours a day, sleeping or awake, I was creating things. I lived there for 6 or 7 years. Near that apartment building is the Akatsutsumi Park with the rotating playground equipment "globe jungle" which was the starting point for my public art activities. I sometimes still visit Akatsutsumi Park. I sit on the bench and make sketches in my notebook or do some thinking. I seem to get inspiration there. Maybe the park helps to enhance the senses; by looking at the movements of people, my brain is activated. The park has significance for me because it's my point of origin; the time I spent in Shimotakaido still means a lot to me today because that's where I underwent a big change. I think there are many kinds of ties between people and towns, but it seems that towns where universities are located tend to become like hometowns. As university students, some people start living alone and it's a time in their lives when their environment changes drastically. So I think that towns which people got to know as university students tend to be important for them even after graduation. A relationship with a town is strengthened by the memories of the time you spent there during a certain phase in your life. Lastly, as this is a meeting to discuss the future of Roppongi, please allow me to show you the stroke order I've invented for the word "mirai" (future). Since my surname is Suzuki, I'm fond of the "ki" (tree) kanji character and I've noticed that there are "ki"s in "mirai." First there is the "ki" character, and when you add a horizontal line, it becomes the character for "mi". When you add seed-like strokes to that, you get the "rai" character. It requires courage to change the character from "ki" to "mi" because the proper stroke order for the kanji characters has been instilled in us. It's difficult to add that extra line. But I feel that summoning up that kind of courage is just what we need to go forward into the future and to create powerful designs. The stroke order for the word "mirai" (future) invented by Suzuki. When you finish writing the last two strokes for the character "rai" (come), it will seem as if the future really has come. Please give it a try. 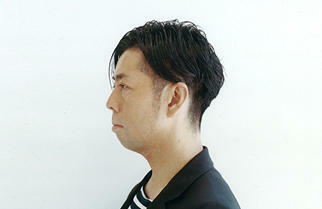 Born in 1979 in Hamamatsu City, Shizuoka Prefecture. 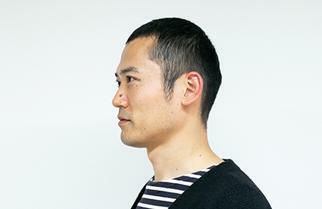 Graduated from the Department of Design at Tokyo Zokei University in 2001. An image installation called "Perspective of the Globe Jungle", utilizing a rotating playground equipment known as "globe jungle", won the annual first prize at the NHK Digital Stadium. 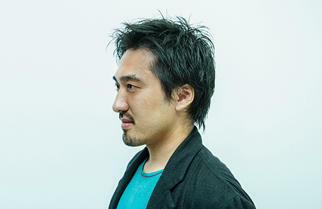 Since exhibiting his work at the Ars Electronica Festival - the media art event in Linz, Austria - has been invited to show his works at many exhibitions and art festivals in Japan and abroad. In 2002, received the Grand Prize at the Philip Morris Art Award for "inter-reflection." The "Zipper Ship" shown at the Setouchi Triennale 2010 drew strong attention. In 2011, held solo exhibition at the Hamamatsu Municipal Museum of Art. A zipper-shaped boat, modeled after his "Zipper Ship" debuted on Lake Hamana, and other projects were also held at the Hamamatsu City Office and in the regional shopping areas. Received the "Artist from Hamamatsu" Award - an award given by Hamamatsu City to promote education and culture. The book "Mabataki to Habataki (Blinking and Fluttering)" containing his first portfolio, was published by Seigensha Art Publishing.